CHICKEN TRACTOR! My book-of-the-moment, a happy find at the municipal library (thanks to Kendall, I rediscovered LIBRARIES a couple of months ago—haven’t held a library card since school days, long, long ago). The chicken tractor concept is simple, and it’s been chatted about around here quite often over the last few years…but not yet tried. The idea is to provide a mobile enclosure for your chickens, and move them to new sections of land every day or so, rather than keeping them in the usual chickenhouse and yard set-up. The chickens work up a small area of ground and fertilize it with their manure, and then it’s on to the next patch—the birds are always happy with fresh places to scratch and bits to eat, and a large area can be improved in no time. The rig can be any design you come up with that keeps the chickens in, predators out, offers shelter from the weather, and is easily moved. Easy! Like most good things in smaller-scale farming, the chicken tractor is a startlingly simple and inexpensive approach that offers deep returns on many levels, from food quality to all-round satisfaction. It’s also kind of the EXACT OPPOSITE of high-tech industrial farming gear and methods that make so little sense to me. And the system works for various other farm animals as well, as in well-known (celebrity!) indie farmer Joel Salatin’s chicken-and-beef rotation at Polyface Farm. So simple, why do you need a book? Well, it’s WINTER around here, all is snow, and reading about growing is the next best thing! In this case, Chicken Tractor, like its to-the-point title, is a perfect example of an energizing just-do-it how-to book, written in enthusiastic, full-on farmer-scientist mode. It’s jam packed with practical instructions and advice, the text assisted by numerous charts and illustrations, with a non-oppressive serving of sustainability philosophy and general food politics worked in, plus chicken trivia (the term “chicken tractor” was apparently coined by permaculture founder Bill Mollison, so now I know). It’s cool to see this copy so considerately well-worn, although this being the original edition from the mid-1990’s, maybe it hasn’t seen that much use. It was published in 1994, quickly followed in 1998 by an “All New Straw Bale Edition,” with the subtitle upgraded from “The Gardener’s Guide to Happy Hens and Healthy Soil,” to the better-keyworded, “The Permaculture Guide to Happy Hens and Healthy Soil.” In any case, this edition is fun tiny farm reading from the library. That looks like a good read. I’ll check it out. I have had a chicken tractor for about a year now, and really like it for the weeding/feeding/bed preparation. If you want, here is a picture: http://sweetrockfarm.blogspot.com/2010/11/chicken-tractor.html I enjoy your blog by the way. Glad to see you posting again. 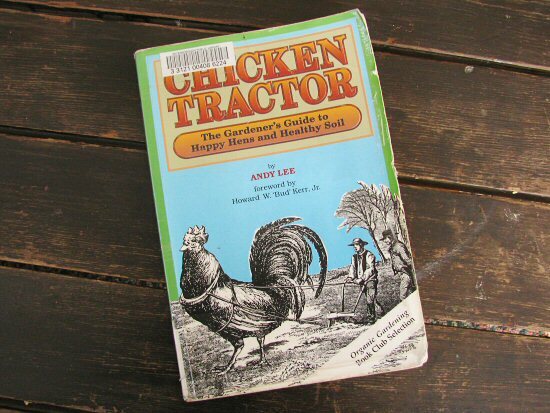 I think chicken tractors are great…but now I’m going to have to read the book! We built chicken tractors because our fixed pen was attracting mice, which was attracting snakes! My husband made some big ones (they fit on our car trailer) from box section, wire mesh and corrugated iron. We just move them around our paddocks and see the improvement in the pasture after a few weeks (plus the grain that they don’t eat starts to grow, so sun flowers and corn come up in surprising places!). We will let them out when we’re home though, I hate having the locked up, but don’t trust our dog to leave them alone. hey, before you take this book to heart check out a later book Day Range Poultry by the same authors. They admit their plans weren’t the best and offer more advice. oh! I’m so glad you’re back. I was thinking about a tiny tractor for (hush hush in this town) urban hens- I spent some time on a tiny farm where we used a tractor for the meat birds… there was so little smell having them move around! and we had something like 30 birds. But again- it’s really only useful in the better weather months, so I’m thinking my girls will have be summer visitors and winter stew. Thanks so much for this post. I’ve read about Polyface in Pollen’s book but hadn’t thought much about it. You reminded me that our rice fields are dormant for much of the year and need fertilization … I’m definitely going to think about a mobile chicken coop! i love this concept but have never tried it. One may think I don’t need a traveling coop so i’ll Iopdress my garden with manure frtom my standing coop. But chicken manure is very “hot’ and can burn plants and its very high in nitrogen. So in large quanties, you could get vigorous plants with few amounts of fruit. Tiny farm operation this year. Our neighbor’s hens did an excellent job eating all the slugs in the garden. For a change, we had peppers without holes on them! This book is what I am also reading right now! Just getting into chickens but loving every minute of it! Great blog! very useful information, i can’t imagine a chicken pulling a tractor. Chicken tractors are great if you have the time to keep moving them around. We find the wooden ones weather and wear out in a couple of years, but metal ones last a lot longer. It is however not always possible to modify certain conditions and restrictions that come with the property. These are contrasted to perceived needs and beliefs in invisble cultural constructs, such as the value of the U. I am working on the closed cycle gardening and will plant our vegetable garden in the area that has been alfalfa and mulch with the alfalfa but since we have animals I will run it though them first and use it as manure.